This is high lace-up jazz shoe. The style has a split soft leather sole with a 6 mm leather or rubber heel. The same style is also available with a full sole with heel. A lace helps adjust fixation. Material and Color: Canvas – White, Pale Beige, Black, Grey, Tan Color. Leather – White, Pale Beige, Black, Gold, Silver. 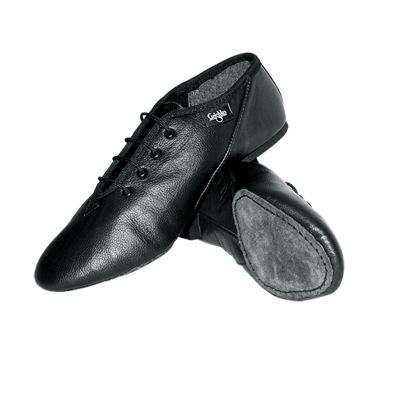 The style has a split soft leather sole with a 6 mm leather or rubber heel. 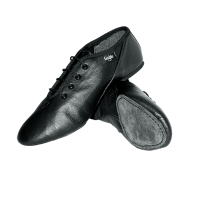 Jazz low shoes with a reinforced vamp look perfectly on a stage and provide maximum comfort during performance. A lace helps adjust fixation. The style has a split soft leather sole with a 6 mm leather or rubber heel. The model has a full soft natural leather sole with no heel. 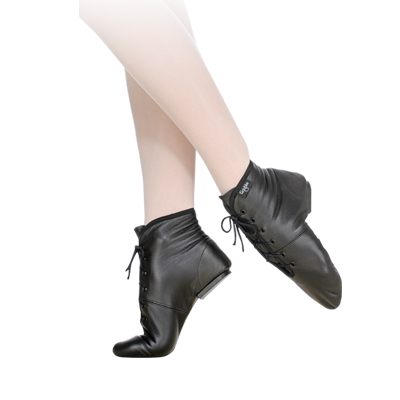 The shoes are specially designed for circus performances but could be used also for modern dance. 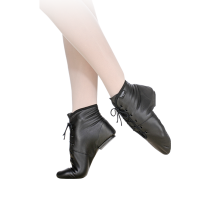 This model has both laces and an elastic side panel to enhance flexibility and ensure perfect fit. It has a split soft leather sole and a 6 mm leather or rubber heel. This style is made on an improved last to mimic the anatomical shape of foot. 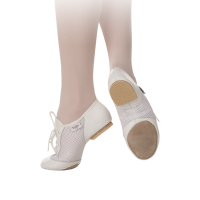 The shoe features pleats under the toes helping stretch toes easily and thus providing additional flexibility to the shoes. This style could be made with no pleats under toes and a split sole and with a heel. Material and Color: Canvas – White, Pale Beige, Black. Leather – White, Pale Beige, Black. 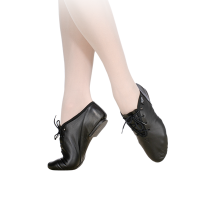 This model is with an elastic side panel to enhance flexibility and ensure perfect fit. It has a split soft leather sole with a 6 mm leather or rubber heel. This model is made on an improved last to mimic an anatomical shape of foot. There is no sole under toes. 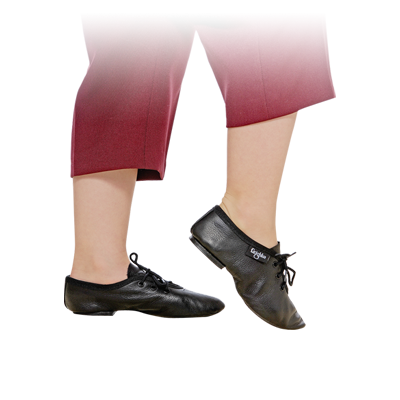 Shoes feature pleats under toes helping stretch toe easily and give additional flexibility to shoes. Side elastics make for very quick costume changes! 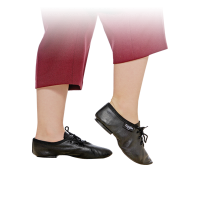 A fixed hard heel provides extra balance. Material and Color: Leather – White, Pale Beige, Black. This style has split soft leather sole and a 6 mm leather or rubber heel. This style is made on an improved last to mimic an anatomical shape of foot. There is no sole under toes. Toe and heel parts and a lace area doubled with a natural leather to protect shoes. New mesh fabric allows foot to “breath”. Flexible features of mesh fabric helps deal with overloading during rehearsing and retain perfect shape during long period of time. Material and Color: Leather combined with mesh fabric – White, Black. This is a whole-cut style with lace (without side stitches) for children. It has a split soft leather sole and a 6 mm leather or rubber heel. A lace helps adjust fixation.